The purpose was to create a raw material which - when used in collaborations between fashion designers and developers - could create garments with interactive surfaces. The decision to create interactive textiles, and not finished garments, was made with the intention that designers could use the textiles to create anything - putting the most qualified people - fashion designers - in control of what the wearables of the future will look like.In late 2015, ATAP, pioneered a new wearable technology: one that would make it possible to invisibly weave technology into any textile, at a commercial scale - using conductive threads and miniaturised electronics. 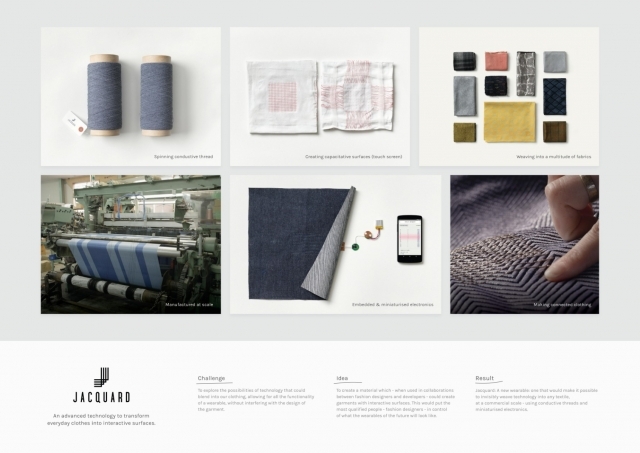 Jacquard is an innovative raw material and platform, newly launched to fashion designers and developers. Now that any textile can be transformed into an interactive surface, entirely new ways to interact with the world will be made possible: from the way we communicate on the move to the way we control our homes. At a hardware level, the innovation of Jacquard lies within its unique ability to seamlessly integrate sensing capabilities into any textile, at a commercial scale. It is also able to withstand extreme industrial processes and regular usage / cleaning. At a software level, a platform has been developed to implement firmware to filter & process data directly from textile (movement, direction, pressure, momentum) to advanced algorithms, enabling the multi-touch sensing to be detected, causing a series of actions that can communicate to your device and all it’s capabilities (products & services). At a hardware level, the innovation of Jacquard lies within its unique ability to seamlessly integrate sensing capabilities into any textile, at a commercial scale - using conductive threads and miniaturised electronics. It is also able to withstand extreme industrial processes and regular usage / cleaning. At a software level, a platform has been developed to implement firmware to filter & process data directly from textile (movement, direction, pressure, momentum) to advanced algorithms, enabling the multi-touch sensing to be detected, causing a series of actions that can communicate to your device and all it’s capabilities (products & services).Jacquard is an innovative raw material and platform, newly launched to fashion designers and developers. 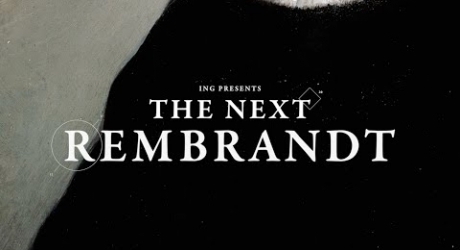 Our intentions were simple and clear: introduce Project Jacquard to the world; provoke conversation around the innovation as the future of wearables; and excite designers and developers to consider partnering with us to develop the technology. On the day of launch, Project Jacquard trended nationally in the US on Twitter. There has been extensive coverage of the launch across the fashion and the tech worlds, with full editorial in publications ranging from Wired to Time to WWD. We have received hundreds of applications and requests from designers and developers: all eager to be involved in the progression of the technology. Technology plays a growing role in our everyday lives, and people are wearing more and more devices that connect them to the internet and all it’s capabilities. With a belief that Technology should be there when you need it, and get out of your way when you don’t, our Advanced Technology and Projects group started to explore the possibilities of technology that could blend into our clothing, allowing for all the functionality of a wearable, without interfering with the design of the garment. The objective was to create a raw material for designers and developers, so that they could work together and transform their own creations into interactive surfaces - connecting to the world around us in a more natural and seamless way.